Many people were left homeless and alone after the devastating earthquake April 2015. When I look out from the window of the bus we can see many temporary camps with tarps and aluminum shelters along the side of road. This week we went to a camp in Bhouda to distribute some clothes for new born babies. Imagine being born in Nepal during this time, or being suddenly a single mother due to entire families being swept away. What shocked me the most is that I came to meet a 16 year old girl who just gave birth to a baby 14 days prior and they are having to live in this harsh lifestyle struggling with the cold every day. She is thinking of going back her own village in Sindupalchowk, but the continuous trembling has weakened the hills and left the villages either cracked, fallen or beneath tons of earth from the landslides. 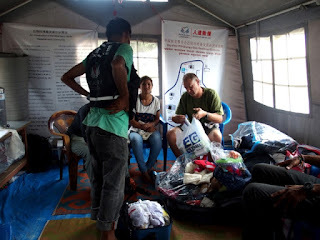 We are providing what few resources we have to share and joining with other NGOs to help and try to make a difference. Sajana brought this young mother money to go back to her village. Our volunteers from NZ brought a couple of huge bags of baby clothes lovingly knitted by women in a knitting club and even some lovely, quilted blankets. The mothers were so appreciative and I enjoyed handing them out to the mothers, one hat, a knitted shirt and booties each. I know this isn’t enough. Our NGO, Kay Garnay for Nepal, is mostly funded with Ama’s little bit of money or donations from our volunteers. These baby clothes came from Kerensa Clark's friends, NZ and were hand carried by Steve and Wendy Trevella, also from NZ. Steve and Wendy brought Andy and Fynn and they all worked full days to get more shelters built-25 more! We are so happy to have been a part of building over 50 high quality shelters in the area already. An INGO donated 7 sewing machines but left without giving training. Changunarayan is on the Valley Rim trekking route. Lots of bikers come through, too. Here Steve and Wendy are giving Ama $1,000 for 2 more shelters. It seems the big picture is not even being looked at for Nepal's future. What these women really need is a job and warm place to live. We have plans for a women’s initiative, but no money to buy the carpet looms, wool yarn, etc. We will be putting a crowd funding project up very shortly for this project. We plan to get the women trained and putting them to work in our knitting/carpet initiative. We hope to work with some of the existing carpet manufacturing factories to help fund our administration costs-rent and my salary, etc. My eBook is available now at https://payhip.com/b/sQu5 If you are planning a trip to Nepal you'll enjoy it. It will save you time as well as money, but more importantly, it will help you to have a better time in Nepal. Many people wonder if they can eat the street food like in Thailand or Vietnam.